Are you constantly trying to find that perfect workout or exercise regimen? Do any of your face creams or lotions claim to be “age-defying” or “anti-aging”? If you answered yes to any of these questions, you may indeed be searching for that fountain—or at least more energy, enthusiasm and well-being. There is nothing wrong with popping vitamins, exercising and taking care of our skin. There may, however, be a more powerful and enjoyable way to reclaim our youthful spirit and all the benefits that come with it. 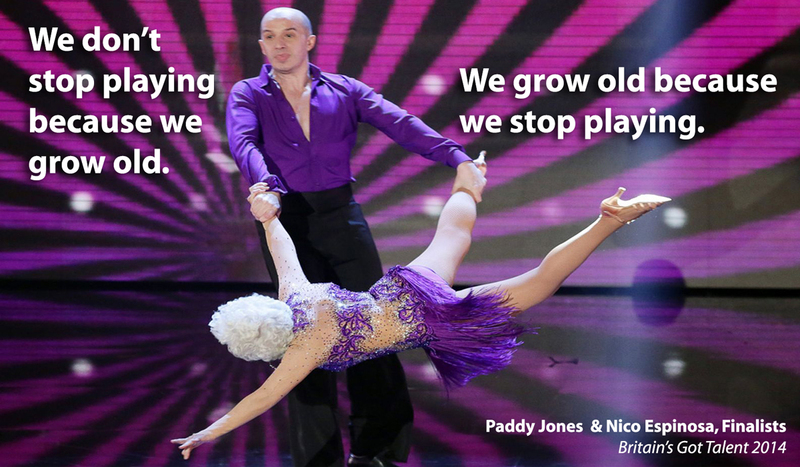 I’d like to introduce you to Paddy Jones, a British salsa dancer who was a finalist in Britain’s Got Talent in 2014. At 81 years of age, Paddy is currently the oldest acrobatic salsa dancer in the world. Even if you’ve already seen this viral video, you may not realize Paddy had only been dancing for 10 years after a nearly 50-year hiatus while raising children and focusing on her family. Paddy decided to take salsa lessons “to learn to have fun again” and to combat loneliness after the death of her husband of 47 years. That’s right. At the sprightly young age of 69, she took her first salsa lesson. Ten years later, she shocked Simon and the world with her display of courage, beauty, rhythm, athleticism and youthfulness. Apparently, Paddy hadn’t just discovered the Fountain of Youth, she had immersed herself in it and become a world-class swimmer. According to two large-scale studies, engaging in challenging play provides powerful protection against cognitive decline, dementia and even Alzheimer’s disease. A 21-year longitudinal study published in The New England Journal of Medicine found that seniors who engaged in the highest levels of cognitive leisure activities like reading, board games, puzzles and playing musical instruments had a 63 percent lower risk of dementia. Dancing also lowered this risk. A recent study of nearly 1,500 seniors published in The Journals of Gerontology found that regularly engaging mental, physical or social play helped seniors maintain cognitive function. Regularly participating in two or more of these activities improved cognition. Activities included sewing, playing cards and games, gardening, and socializing with friends and family. 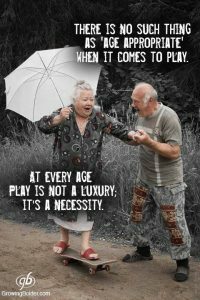 Numerous studies have shown that aging playfully offers a whole host of other health benefits including improved memory, mood, immune functioning, heart health, physical strength, stress reduction, and social connection. Playful and creative stimulation can also reduce anxiety, depression, isolation and even the need for medication and doctor’s visits. So just how much play do we need to achieve a therapeutic dose? Fortunately, we don’t have to train for 10 years, have good dancing genes (or jeans), or move to England to compete in Britain’s Got Talent. We just have to make a commitment to playing, even a little, every day. When we commit to giving ourselves a daily dose of fun, even 5 or 15 minutes of play can help us discover our own personal Fountain of Youth. Of course, longer periods of playfulness help us step into flow, an optimal state of being that is timeless and free of limitations, judgment and worry. Flow is where the fountain gets deeper and we can dive headlong into joy and, I believe, our primary reason for being here—to remind each other that life is a gift.